Weather has long been a suspected culprit for the onset of migraines, and a new study adds to that notion. 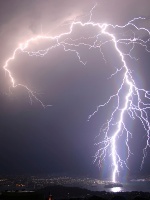 University of Cincinnati researchers have found that lightning may help trigger a migraine, or even a regular headache. This is the first study to tie lightning to headaches. It might help chronic sufferers anticipate headache and migraine arrival more efficiently, allowing them to take their method of prevention more quickly in anticipation. Researchers found that there is a 31% higher risk of headache and a 28% higher risk of migraine in people who are chronic sufferers when lightning strikes within 25 miles of home. If you tend not to get migraines, don’t stop reading: lightning increased the risk of new-onset headache and migraine by 24% and 23%, respectively. It is guesswork right now as to how environmental factors like humidity and barometric pressure influence severe headaches. Most believe they do, but we don’t know how or why, exactly. This study helps to clearly show a link between lightning and headaches. ALSO: Foods that could be triggering a migraine. In the study, researchers used special mathematical models to determine if the lightning itself was the cause of the increased frequency of headaches or whether it could be attributed to other weather factors encountered with thunderstorms. The results showed a 19% increased risk for headaches on lightning days, even after accounting for these weather factors. This means that those tremendous electric currents from the sky bear unique effects on headaches. This might happen due to the electromagnetic waves that are emitted from lightning, or perhaps due to a rise in air pollutants caused by lightning strikes that can release fungal spores into the atmosphere tied to migraines. What does all this mean for us? On one hand, it is always interesting and important information to know about hidden triggers for health problems. If you suffer chronic migraine or headaches and believe they can be influenced by the environment, it would be wise to keep tabs on approaching thunderstorms. And get ready. Natural or conventional, get your pain remedies on hand. Martin, G., et al., “Lightning and its association with the frequency of headache in migraineurs: An observational cohort study,” Cephalalgia, published online January 24, 2013.